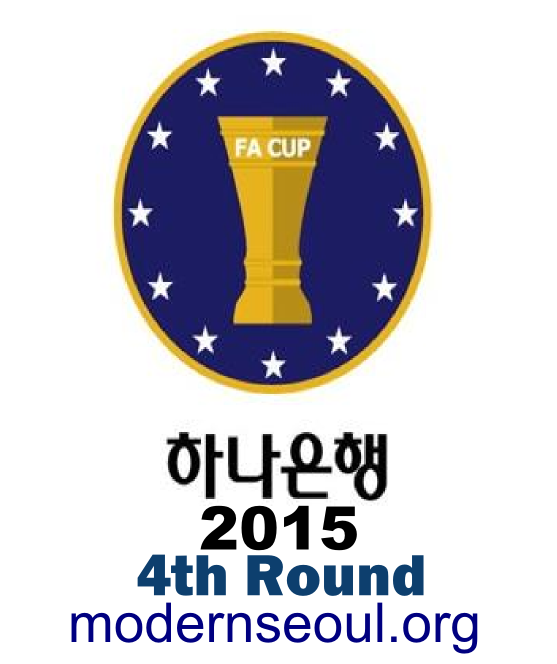 The big guns from the K League Classic are entering this seasons Korean FA (KFA) Cup. South Korea like any footballing nation has an exciting cup, the FA Cup of Korea has been running since 1970 and has a proud history. Although most K League sides focus on the league and sadly cup games are renowned for their low attendances, they can produce some shocks and the interest is building and the competition improves year on year. This year the competition started in March and had a record number of teams enter 79 (up from 72 in 2014). Teams still in the competition include University sides and amateur teams as well as the professionals from the K League Classic / Challenge. The overall winner also gains a place in the 2016 AFC Champions League. 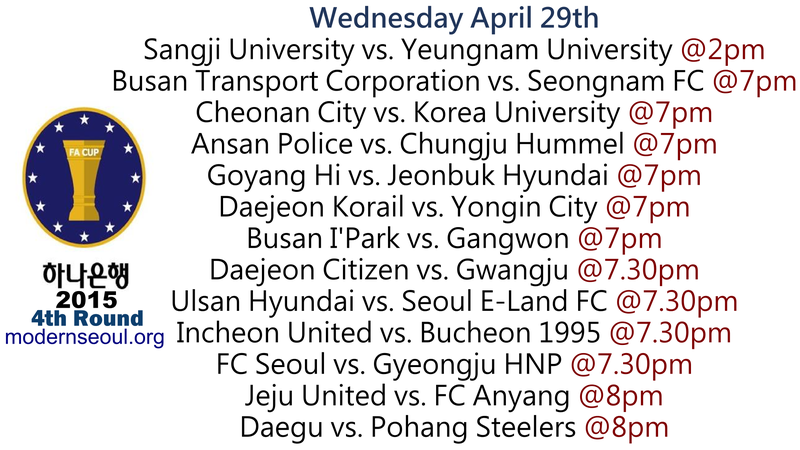 All games apart from: Hwaseong vs. Changwon City (May 12th) and Ulsan Dolphins vs. Gimpo Citizen & Suwon Bluewings vs. Jeonnam Dragons (both May 13th) are being played on Wednesday April 29th. If scores remain even at full time, extra time and penalties are used to determine the winners. The only afternoon game between 2 of the 3 remaining University sides. Busan currently play in the National League (3rd tier) where they are 7th at the moment. Holders Seongnam are currently 7th in the K League Classic. Cheonan City are currently 9th (of 10) in the National League (3rd tier). Korea University have beaten 2 K3 sides on their way to the 4th round. Ansan Police and Chungju Hummel both currently play in the K League Challenge. Ansan won their league match 1-0 back in March. Goyang Hi are presently 4th in the K League Challenge with the best defense in the league. Jeonbuk Hyundai have a 5 point lead at the top of the K League Classic. Daejeon Korail and Yongin City both play in the National League. Daejeon are 2nd and Yongin are 6th. Daejeon won the previous game between these sides 1-0. Busan are 11th in the K League Classic, whilst Gangwon are 9th in the K League Challenge. Gangwon beat Gyeongnam 2-1 in the previous round. Daejeon Citizen and Gwangju are both K League Classic sides. 12th and 8th respectively, both sides won promotion to the top tier last season. Ulsan Hyundai are currently 2nd in the K League Classic, whilst Seoul E-Land are 10th in the K League Challenge without a league win all season. A local derby of sorts here as Incheon United (10th in the Classic) host Bucheon 1995 (5th in the Challenge). Incheon have not won all season, but have drawn 6 times in 8 games. Last years Runners Up FC Seoul (9th Classic) host Gyeongju HNP who are leading the National League (3rd tier). Jeju United who are currently 6th in the K League Classic host FC Anyang who are also 6th but in the K League Challenge. The final game has K League Challenge leaders Daegu hosting K League Classic side Pohang Steelers (4th placed in the league). For details on the K League and K League Challenge, please CLICK HERE.